This week, I will be sharing with you some of the products that I got from the Korean Products Festival 2017. This was a two day event that was held in SMX Aura. Check out this video of what transpired! The first product that I will feature are these two facial masks from Mijin Cosmetics. Mijin Cosmetics, as I have heard and researched, is known for their facial masks. I got a brochure from them, and I think think have close to a hundred variants of facial masks. During the Korean product festival, they closed early because they sold all of their products! I was lucky to have had the chance to buy one pack of 10 of the Horse Oil and one pack of 10 of the Jeju Mayu Moisturizing Mask. Both products are for nourishing and firming and tightening. The Jeju Mayu is part of the Selection Prestige Mask. The only difference, according to the lady in the booth, is that the Jeju Mayu just has a higher moisturizing effect. These products that they have are certified by CFDA (Certificate of Health in China). The horse oil that they have is from Jeju Island and it provides moisture and vitality to lackluster skin. I actually gave some Horse Oil Masks to my aunts, so that they can try it. I’ve been using the Jeju Mayu Moisturizing Mask 3 times a week, and it really moisturizes the skin. I really feel that these products are working! *Mijin Cosmetics is a producer/seller of sheet mask packs and an OEM/ODM specialized manufacturer. They possess some of the best technological capabilities and continue developing various products such as basic cosmetics and skin care patches. Would I recommend these masks? Of course! I already did! If you are scared to take the leap into entrepreneurship, I suggest that you try out FREELANCING first. To those who don’t know, I was a content writer in ODESK (now Upwork) way back in 2010. I got a lot of foreign clients, and actually learned from my experience as a content writer. Starting this Friday, before The Freelancer Fair 2017, which will be held on Sept. 2, 2017, I will be writing a lot about freelancing, how to start freelancing, what you need to do to sustain a freelancing career, etc. The ultimate benefit for me when I went into freelancing was really to learn more about the industry and to see if it was actually for me. I love writing, so the immediate thought for me was, why not earn from my passion? But honestly, the ultimate benefit of having a freelancing career is to be flexible enough to manage your time and to have no cap in terms of the pay that you get. If you want to earn more, you can manage yourself (your time, your resources, your rates) effectively so that you can achieve the dreams that you have. Freelancing offers flexibility in all aspects. If you are a mom like me and you want to be there for your children, you can fix your freelancing schedule to allow that. You can earn for your family, while being able to be present during your child’s milestones. Also, freelancing can allow you to pursue your passion and to earn from them. You will be able to work whenever, wherever and even choose tasks where you can apply your skills and take on roles that interest you. So what jobs or tasks can you actually take on? You can choose from countless jobs available online today such as teaching English to foreign students, clerical work, social media management, writing, customer service responders and more! If you want to explore the world of freelancing and the opportunities you can get to earn while staying at home with your family, here are a few jobs you may want to try out. If you enjoy organizing schedules, emails and taking care of your client’s day-to-day tasks then this job may be the best fit for you! Virtual assistants have a fixed schedule or work at the time given by their client. You can work at the comforts of your home while having a client/boss via Skype or other messaging platform giving you instructions on what they need to be done. There are students from around the world who are looking for English tutors from different websites. There are numerous sites here in the Philippines such as RareJob or 51talk. If you enjoy typing and are actually great at it, then you can earn from using that skill! There are clients who need transcribing in different kinds of fields such as medical or legal fields. As a transcriptionist, you can get paid per word, per line or each audio minute you transcribe. This job doesn’t require a fixed time schedule so you can choose to work anytime you want. If you’re more on the creative side and enjoy writing then you will also be able to find different kinds of tasks from blog writing, copywriting, business writing. There will always be a need for this skill. You’ll just have to find clients at the right websites or get referrals from your own connections. You can be paid per word or per article, and usually this does not require a fixed schedule from you but would have deadlines instead. There are a lot of other things that you can do, and a lot of tasks that people outsource. Think of any process or any tasks in a business, and i’m sure it can be something that a freelancer can do. If you want to learn more about FREELANCING, you can attend the annual event called The Freelancer Fair (http://manilaworkshops.com/events/thefreelancerfair2017). What are you passionate about? What are your skills, your strengths? After identifying these, which job do you think is the best fit for you? Share your thoughts with us and let us know which you think are the best freelancing jobs out there for Moms like me! It’s so nice to see and reunite with friends. A few days ago, I met up with a friend whom I haven’t seen for the longest time. I think the last time we saw each other (but didn’t really get to talk) was when he and his wife attended our homeschooling conference in 2016. So when I found out that he had a new coffee business, I took the opportunity to catch up and interview him for my blog! Today, i’ll be featuring Richard Torres, one of the owners/founders of Nitro 7 Coffee. I’m a family man. Nothing helps me de-stress more than spending time with my beautiful wife, whom I’ve been married to for 5 years, and our 2 boys. I love business, coffee, arts and design, and just finding ways to make things work. Many describe me as a handyman, a fixer-upper. And I think I have a pretty good eye for design. I started out as a small-time salesman in college, selling real estate, pagers, mobile phones and odds and ends. After university, I worked as business development manager for a mobile content provider company, and then later on built my own ad agency and production house. On the side, I did take on some marketing consultancy jobs. Eventually, I tried out designing, building and selling condo units and houses. Nitro 7 is my newest venture. My goal is really to build a global brand! Ginger: Hi Richard! Can you tell our readers what your startup or brand is? 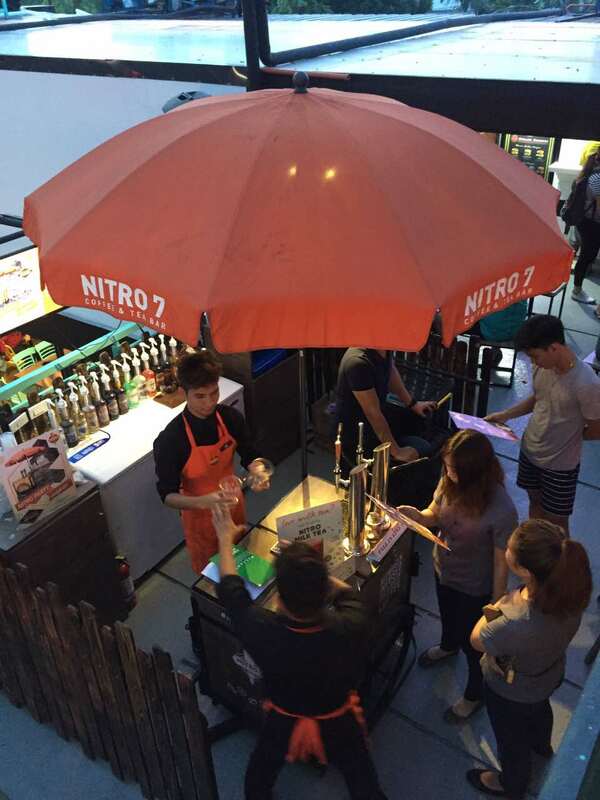 Richard: Nitro 7 is a coffee retail brand that serves nitrogen-infused coffee and tea products. #Nitrocoffee is an 18-hour cold brew coffee that’s later on infused with nitrogen gas. It has a full-bodied flavor with very low acidity. Nitrogen gives our drinks their added sweetness without the sugar, and a thicker, creamier mouthfeel without the milk. Richard: I’ve been in business since college, but Nitro 7, which is my first retail startup, has been operational for 9 months now. Ginger: Who is your target market? Why did you choose this market? Richard: So far, our patrons are from a broad demographic. Each bar seems to have a different market. But generally speaking, millennials love us, and we love them back. We’re a delicious cup of coffee that’s very reasonably priced. The drama of our nitro coffee, it’s cascade and crema, and our whole setup is very visually appealing and attracts a lot of active social media users as well. Richard: Both my partners and I are actually bible-study group mates. We’re all businessmen and coffee aficionados. We wanted to create something that would be pleasing to God, and that we could personally patronize because we loved the product so much! Initially, we considered putting up a regular coffee shop, but there were so many of those in the market already. So after extensive research and product testing, we came across Nitro coffee, which is huge in the US. 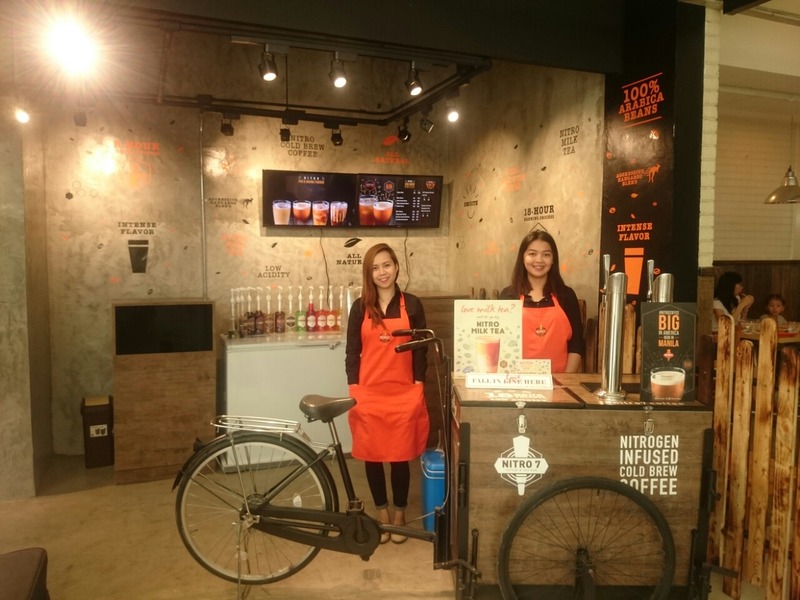 Today, our 9-month old baby, is the first Nitro Coffee and Tea bar in the Philippines, and has 12 branches strong. Richard: Too many to mention! Haha. Retail was new for me, and I had no technical know-how in terms of the draft system or using nitrogen. I had to learn along the way. But like I said, I enjoy making things work, and this is what I did for our setup and system. Other obstacles are being overly dependent on third-party suppliers, and having to manage different kinds of people. In a start-up business, you really have to step up and learn how to do everything yourself. Richard: Innovating– creating new products. Engaging trial. Encouraging loyalty. You have to open-minded and be willing to wear many hats. Richard: Creativity, perseverance, and a willingness to go the extra mile. Give Praise – Praise God and have a thankful spirit. Remember that you are one of the blessed ones who’s given the opportunity to have a business to bless others. Be Persistent – Believe you can do it! Be determined to make things work. You have to have that drive and dedication to your business so it overflows and motivates your team. You have to learn how to do everything yourself, especially in the beginning. Be willing to get your hands dirty! Pray – and then pray some more! You can never pray too much. Ask for the guidance and the wisdom to get you through you day to day. Lift everything up, and remember that ultimately, your business belongs to Him. Be Patient – Learn how to wait and how to endure. There will be a lot of obstacles swinging at you from left and right, from top and bottom. Patience and endurance will build you character and entrepreneurial spirit. Richard: As an advocate for entrepreneurship, I’d like to say yes, but the truth is, no, it’s not for everyone. There are a lot of brilliant people who aren’t wired to be entrepreneurs, and that’s okay. Richard: You’d be surprised by how many of the people you know are looking to invest in something. Just share your concept to people who you think might be able to help you. Richard: We consider our bars as our billboards, but social media is our friend. We also intend on maintaining a product that is consistently high-quality and delicious. We’ve also been getting a ton of franchise inquiries and are looking at this as a logical next step. Richard: We have a POS system and inventory management system. But in general, we have not maximized tech tools at all. All of our activity online is organic. Richard: I said it before, I’ll say it again. Business can be overwhelming, and PRAYER is so important. Ginger: Keep the faith, dude! There you have it, readers! Wise words from Richard Torres of Nitro 7. Hope you can visit their branches! Thank you again, Richard, for sharing your experiences! I feel so refreshed! I did some decluttering in my home, and I’m so eager to face the day. It feels different when you see that your cabinets and drawers are so organized. It seems like they can breathe more, and you can breathe more 🙂 One of the things that we can do to save money is to hold a “garage” sale. In my case, it was more like a sala sale! Check out how my house looked for the past days. For those looking to move into a new apartment, office or space, check this out! 1.5HP Inverter Aircon from GREE at Php 38,000+. When you buy this, you get a FREE (yes, take note of this!) 1HP Aircon from GREE, probably worth around Php 15K+. For those looking for quality luggages for travel this year! For those looking for clothes, comforters and things for their baby! 10. Pampers Diapers.. Save Php 100 if you buy 2! 14. US Assorted Loaf at Php 189.oo (Buy 1 Take 1) — Flavors are Rhum Loaf with Almond, Coffee and Red Velvet! (it actually shouldn’t be as white as paper!) means that your teeth is strong. But of course, I want to bring my teeth back to (at least) the actual color that it should be. From research, I got to find out that if your teeth are more yellowish than before, it is due to both intrinsic and extrinsic stains. Extrinsic stains are those that can be found on the surface of the enamel, which is the the hard and outermost layer of your teeth. Enamel that is said to be even harder than bone can still be easily stained by dark-colored foods and beverages. These things are high in chromogens that produce pigment that stick to tooth enamel. The other cause are intrinsic stains, which (as the term used explains) happens within the tooth. Different factors alter the light-transmitting properties of the enamel and the underlying dentin. These are sometimes caused by medication that tend to cause discoloration. Ingredients like chlorhexidine, minocycline, etc. can cause these intrinsic stains. After seeing this, I wanted to try AP24 Toothpaste by Nu Skin. I just saw it on my friends wall, and I am not in anyway, selling this product. I just really wanted to try if it’s effective. The active ingredient is Sodium monofluorophosphate (MFP), which is an inorganic compound with the chemical formula Na2PO3F. (*wikipedia). MFP is odourless, colourless, and water-soluble. This salt is an ingredient in some toothpastes. Noticed that it was a bit whiter. I’m excited that it can actually whiten it more, since it has been just exactly 9 days. I’ll continue using the product and let you know how it goes! The toothpaste is not that “bubbly”, but it’s not really something we should look for. I think it does it’s job of fighting cavities, which is good. Overall, I think that the AP24 Toothpaste of Nu Skin does what it says it does. I think its safe to use (I’ve heard of whitening products that actually make your teeth weak), so I wanted to share this with you so you’ll consider a more effective and safer alternative. I’ll update the photo again after using it for two more weeks. Have you tried this AP24 toothpaste? How was it for you? Was it effective? Please share it in social media and tag me (@mommyginger).